Heartland Outdoors Forum | Cougar in East Peoria??????? and yeah, that tail really bothers me. way too dark. Anybody else wondering why the bird feeder is 3 ft off the ground? Just saying…. I wouldn’t want to make this Tom angry but it’s clearly a domestic cat. The cougars here in Macon county are much taller, more aggressive, and have less teeth!! I think its a bobcat/ cougar cross breed, a bougar. No Photoshop going on in that picture, I know its a custom to put out giant bird feeders in Illinois so we can feed the numerous Dodo birds that abound here while keeping out the Sasquatch. Look I think I can see Nessie out over there in the water! Definition from Wikipedia should explain that sign for ya. 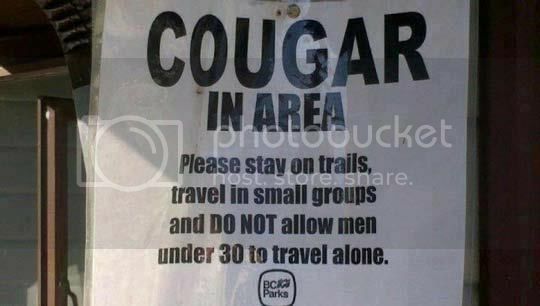 Cougar is a slang term referring to a woman who seeks sexual relations with considerably younger men. The term does not apply to those woman who have a stable and lasting relationship with their younger partner. Typically, the term refers to women over 40 years old who pursue sexual relations with people more than six years younger. The origin of the word is debated, but it is thought to have originated in Western Canada and first appeared in print on the Canadian dating website Cougardate.com, and has been used in TV series, advertising and film. The 2007 film Cougar Club was dedicated to the subject, and in spring 2009 TV Land aired a reality show called The Cougar. The sitcom Cougar Town originally explored the difficulty and stigma of many so-called “cougars”. it isnt real. it was supposed to be a joke. one that backfired completely.